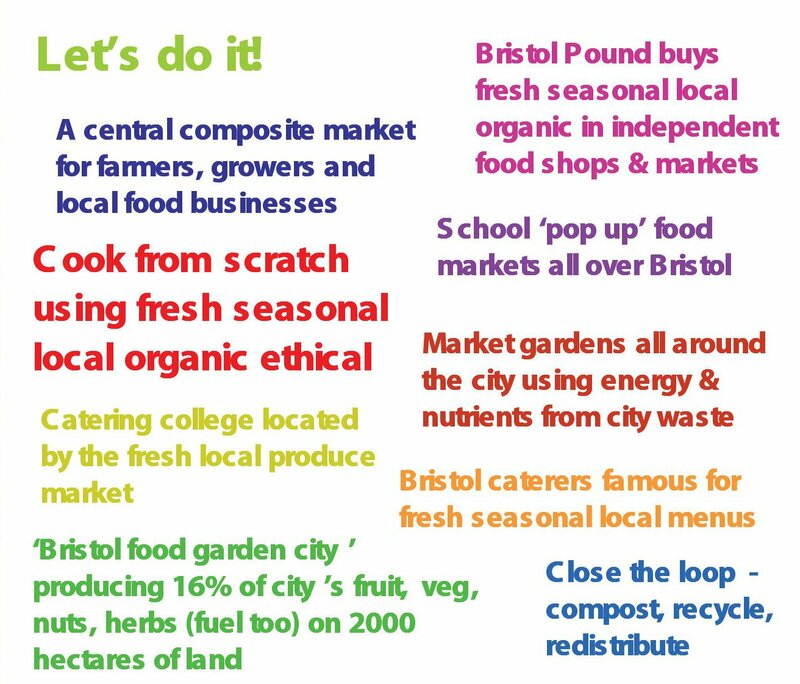 Joy Carey is a Bristol-based independent consultant on sustainable food systems and author of the recently published baseline research report Who feeds Bristol? : Towards a resilient food plan commissioned and supported by NHS Bristol and Bristol City Council. Joy has been involved in community development and local food initiatives for over 20 years, in the early 90’s growing Asian and Caribbean vegetables in inner city Birmingham and later working with an organic box scheme in rural Norfolk. She joined the Soil Association in 1998 and from 2004–09 was Head of Local Food and Market Development. While at the Soil Association she led work on re-localising sustainable food systems around the UK through building direct connections between food producers and their customers (box schemes, farmers markets, community supported agriculture, local food business networks and sourcing local and organic food for schools and hospitals). She is currently involved in managing research for the Making Local Food Work partnership to support the future development of community food enterprises and in evaluation of the Big Lottery Local Food Fund grants programme. Joy has produced a film about organic cotton farmers in India, is a policy advisor to the Soil Association and is on the Bristol Food Network steering group. “I hope that the Who Feeds Bristol report will enable the city’s decision makers to make more informed decisions. Understanding the bigger picture and how the different elements of the food system are inter-related is vitally important. Too often decisions are made about one element of the food system without consideration for the knock on impacts that decision may have on the others. That’s why I chose to look in detail at each of the six main food system components. It’s clearer now how the loss of Bristol’s greengrocers affects the fruit and veg wholesale market in St Philips and how vitally important the wholesale market is for south Wales and SW England; or why it is so much easier for independent butchers to supply locally reared meat than it is for supermarkets.